You know what time it is? Meal prep time! It’s kinda, sorta one of our all-time favorite things here at Happy Body Formula. It’s the cornerstone of getting healthy and staying healthy, if you ask us. That’s one of the reasons we create our make ahead meal plans. We find people’s major gripe with continuing a healthy lifestyle being that pesky desire to reach for the easiest thing when the hunger hits. Turns out, this generally isn’t a wholesome, balanced meal. Enter meal prep. Imagine this: containers stocked with veggie side dishes, pre-made and pre-portioned protein, freezers full of soups, stews and broths, frittata slices that you can easily walk out the door with in the morning. The trick is truly creating your own convenience, and that is why we prep! Before you get started, if you want to make meal prep a habit, we highly recommend stocking the kitchen with a few cooking essentials..
BPA-free tupperware set. We prefer glass over plastic. If you’re going to batch cook, you’ll need a safe place for all your food to rest! Getting a set that has a variety of sizes is the way to go. We love this snapware 24-piece BPA-free glass tupperware set if you want to make the switch to glass storage. It’s a fantastic set that should suit most needs and for a great price. Slow cooker. The best meal prep recipes are ones that you can set to cook and forget. It can be as easy as dumping a mess of protein, veggies and liquid into the pot and pressing a button to yield something delicious, versatile and freezable. We love a good old Crock Pot slow cooker, or if you want to invest a bit more and upgrade to something more functional that allows for faster cooking, you have to check out an Instant Pot. You can use it as a slow cooker, pressure cooker, and a yoghurt maker!!! Eco-friendly lunchboxes. We love the ECO stainless steel, three-in-one lunchbox. It is the perfect way to pack your lunch and keep your sides separate, so they don’t mix and say go soggy. It’s BPA-free and totally non-toxic. Plus, it’s cute! Now, we’re rounding up 15 recipes that are perfect for making ahead of time. May you find your inspiration to get in the kitchen and batch cook! Granola is definitely a convenience food, but the store-bought stuff is generally packing in loads of sugar under the guise of whole grain, gluten-free and good-for-you labels. Instead, make it at home! This version is grain-free, boasting healthy fats and a protein punch with nuts and seeds of choice. It’s a good pantry staple for busy mornings and picky kids alike. Get the recipe from Raising Generation Nourished. Frittatas are the best thing to prep. They taste good both cold and hot, and you can literally run out of the door with a slice in hand. This is loaded with sausage, bacon, sweet potatoes and kale so you’re not missing a beat in terms of nutrients. Get the recipe from A Calculated Whisk. You can also try our Spanish potato and onion tortilla frittata recipe. Here’s another sweet option for brekky without any added refined sugar. The apples and sweet potatoes lend their natural sweetness to this bake, which you can easily heat up in the AM. It contains fat and protein from coconut milk and eggs, so it’s great fuel. Get the recipe from Paleo Running Momma. Homemade sausage is great. You can cook it and freeze it that way, or freeze them raw to defrost and cook later. You can use chicken, pork, turkey, or a mixture of both and flavor it how you like. It’s a versatile way to get some protein first thing in the AM without giving it a second thought. Try our recipe for chicken apple sausage, which is gluten-free, paleo and AIP friendly. Roasted roots are one of the tastiest foods on the planet (yes – this is an objective opinion). It’s the perfect blend of sweetness in your savory, and it’s such an easy way to add some hearty and healthy starch to dishes. It’s a nice base for eggs in the morning, or you can add sausage if you want to up the protein. Get the recipe from Eating Bird Food. Roasted brussels and bacon are a match made in heaven. When you add tangy mustard and crunchy pepitas into the mix, things get really freakin’ good. This is a lovely veggie side with some healthy fats baked in, so all you need is simple protein to make it a complete meal. They’ll warm up nicely in the oven. Get the recipe from How Sweet Eats. This complete paleo meal is basically a bowl of make-ahead foods. Keep taco meat, roasted veggies and fresh avocado and salsa on hand, and you can easily pack a “burrito” for lunch – no tortilla required. You could even add some pre-cooked rice or cauliflower rice beneath. Get the recipe from Eat Drink Paleo. Here’s a three-part meal prep dish you can easily make and repurpose if you’d like. Toss up the base, whizz up some delicious dressing and bake a few salmon filets for good eats. This makes the perfect office lunch to pack in your lunchbox. Get the recipe from Paleomg. Stew is a great meal to prep ahead of time – especially when it turns out to be a complete meal. This one has plenty of veggie action, protein and healthy fats from the chorizo and big flavor. You can generally store things in a liquid quite well in the freezer, and this dish is no exception. Get the recipe on our blog. Cobb salad is a lunch staple. Just cook up some bacon, chicken and boiled eggs at the beginning of the week and toss this masterpiece together for lunch or dinner the next day. Get the recipe from Healy Eats Real. Soup is an obvious meal prep darling with its wonderful capacity for cold temps (we’re talking about the freezer!) and an uncanny ability to be even better the next day. A blended soup is a nice canvas for additional veggies, protein and toppings. This sweet potato soup is easy and affordable to make in big batches. Get the recipe from Perchance to Cook. Lasagna is a batch cooking staple. This variation is grain-free, instead using butternut squash for the noodle layers. It’s also dairy-free. You can easily store it in slices in the freezer, or just cut into it for dinner every night because you won’t get sick of these leftovers. Get the recipe from Anya’s Eats. 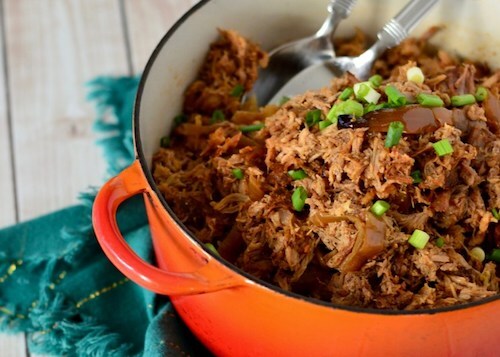 Pulled pork is cheap and easy to make in big batches, especially with the slow cooker in the picture. It pairs beautifully with most any veggie, over mashed cauliflower or cauliflower rice or stuffed inside of baked sweet potatoes. Get this smoky and savory recipe from Real Food With Dana. Once again, the slow cooker steps in to make healthy meal prep a total breeze. Simple shredded chicken can be used for mayo or lettuce-based salads, a protein addition to any soup, a filling for lettuce wraps or burrito bowls. The sky is the limit. Get the recipe from Fed & Fit. Meatballs are a perfect batch cooking staple. There are so many different ways to make them with different types of mince, spices and sauces. This sweet and sour variation should help keep things interesting, and they’ll freeze nicely. Experiment with your favorite flavors! Greek, Italian, Asian – you name it. Get this recipe from Food Faith Fitness. Tell us your favourite meal prep recipe! Which ones on our list are you excited to share with us? Comment below and share with a fellow batch-cooking friend. Also, make sure to check out our FREE 7-Day Make Ahead Meal Plan & Challenge.